We can thank the 14th and 15th century Italian merchants for developing the double-entry method of accounting still in use today. 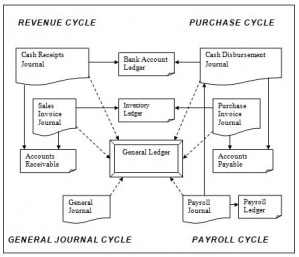 The financial transactions of any accounting system can be grouped into four major accounting cycles: Revenue, Purchase, Payroll, and General Journal. Accounting system transactions in the form of sales invoices, receipts, purchase invoices, checks, and payroll entries are posted to the appropriate journals. Simultaneously — as a form of internal control — these postings are recorded in the general ledger, or “GL”. The GL is an important part of an accounting system because it accumulates all transaction activity, where it is organized by account class. Various reports, including financial statements, can be prepared from the data collected in the GL. Corrections or necessary adjustments can be made to the general ledger by creating adjusting journal entries, posted to the general journal. Order Entry. Invoices entered through direct entry, sales orders, or a point-of-sale (POS) system, such as a cash register, are posted to the sales journal. These entries also accumulate on the accounts receivable ledger, organized by customer. If the business maintains an inventory, the posting of sales also affects the inventory ledger. Finally, all sales journal activity is also posted to the GL. A discussion of your revenue cycle should be covered in your revenue procedures. Cash Receipts / Deposits. Receipts on sales and other bank deposits are posted to the cash receipts journal. Sales receipt information also accumulates on the accounts receivable ledger, organized by customer. These postings are also entered on the bank account ledger. Finally, all cash receipts journal activity is also posted to the GL. Accounts Receivable. Accounts Receivable, and important part of any accounting system, is a separate journal that records both sales and cash receipt data by customer. 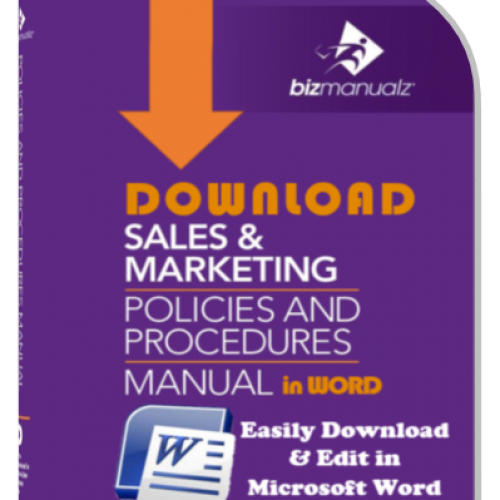 The data comes from the postings to the cash receipts journal and the sales invoice journal. Purchase Orders / Purchasing. Invoices entered through direct entry, or through purchase orders, are posted to the purchase journal. These entries also accumulate on the accounts payable ledger, organized by vendor. If the business maintains an inventory, the posting of purchases also affects the inventory ledger. Finally, all purchase journal activity is posted to the general ledger. Cash Disbursements / Checks. Payments on account or for expenses are posted to the cash disbursement journal. Payment on account information also accumulates on the accounts payable ledger, organized by vendor; these postings are also entered on the bank account ledger. Finally, during this cycle of an accounting system, cash disbursement journal activity is posted to the general ledger. Accounts Payable. Accounts Payable is a separate journal that records both sales and cash receipt data by vendor. The data comes from the postings to the cash disbursement journal and the purchase journal. During this part of an accounting system, payroll data by employees are entered into the payroll journal. These postings are also entered in the cash disbursements journal and the payroll ledger. Finally, all payroll journal activity is also posted to the GL. Corrections or adjustments to the above major transaction cycles can be made through adjusting journal entries, posted directly to the general ledger. These are also compiled in a separate journal, known as the “general journal”. The specific postings, as outlined in the cycles above, do not necessarily take place as separate steps, especially in computerized environments. There are only two basic posting methods in computerized accounting systems: real-time and batch posting. In real-time posting, the source transaction (check, bill, payment, receipt, etc.) is posted to the specific journal and any related subsidiary ledger (e.g., accounts receivable, accounts payable, inventory) and is simultaneously posted to the general ledger. In batch posting, the journals and subsidiary ledgers are posted, but entries are not yet posted to the general ledger. Posting these journals to the general ledger is done separately. Typically, a group of transactions (often a full day’s worth) is entered. Later, after the journals are reviewed for accuracy, this entire day’s group, or “batch”, is posted to the general ledger. To understand this posting process of an accounting system better, it would be helpful to follow specific transactions through a sample company. First, however, we need to define various accounting terms and concepts. We can thank the 14th and 15th century Italian merchants for developing the double-entry system of accounting that we still use today. It is widely believed that Benedetto Cotrugli (aka, Benedikt Kotruljevic) was the first to document this concept of double-entry accounting (in his accounting policies and procedures, perhaps?). In 1458, he wrote Delia Mercatura et del Mercante Perfetto (Of Trading and the Perfect Trader), which included a brief chapter describing many of the features of double-entry accounting. In 1494, Luca Pacioli, from San Sepulcro in medieval Tuscany, published the Summa de Arithmetica‘s 36 short chapters on bookkeeping (entitled De Computis et Scripturis, or “Of Reckonings and Writings”) so the subjects of the Duke of Urbino could learn how to conduct business and provide the trader with a fast, accurate method to determine his assets and liabilities. For many centuries before this, commercial transactions had been recorded — journalized — on paper, papyrus, or clay tablets. However, these journals provided only totals of transaction groupings. It was the Italians who first recognized that it is impossible for a business transaction to occur without affecting at least TWO accounts. There can never be only one effect from a transaction — there has to be balance. An Italian farmer sells wood to a shipbuilder for 400 ducats. To account for this transaction, he would record, “wood sale – 400 ducats”. His “sales” account has increased by 400 ducats. But, what else has happened? What other account was affected? His “cash” account also increased by 400 ducats. What if he sells his wood to the shipbuilder on credit and receives no cash? In this case, it’s his “accounts receivable” account that increases by 400 ducats. Today, double-entry bookkeeping is used for recording a transaction in two or more different places, or ledger accounts. This practice simplifies finding errors since the totals of both ledger accounts should agree. Bookkeeping entries are divided into debits and credits. The debit side of an accounting system is typically the left side of the ledger page and credits are on the right. The origin of the words “debit” and “credit” come from the simple concept: “who owes you” and “to whom you owe”. Debits are transactions relating to purchases, expenses, or increases in an organization’s assets. Credits are transactions related to revenues, or an increase in the firm’s equity and liabilities. Recording a transaction requires a debit and a credit entry. If the entries are correctly recorded, the totals on both sides of the ledger agree. These account types are the general account classifications used in an accounting system. They are also used to organize the general ledger, from which financial statements are developed. Your accounting policies and procedures should take into account the main accounting cycles, accounting methods, and accounting terms to guide the operation of your accounting system. 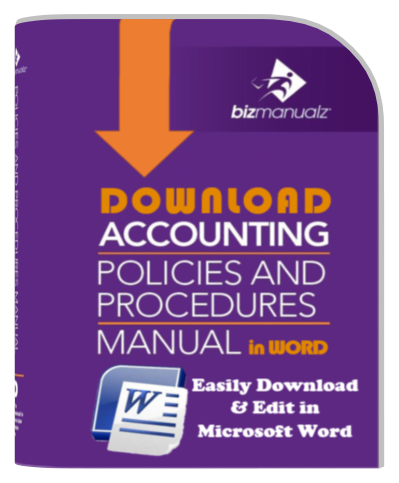 Your Accounting Manual and associated accounting procedures are intended to satisfy the documentation requirements for an Accounting Management System. Department managers and supervisors are responsible for identifying any additional documents needed to ensure the effective planning, operation and control of processes. 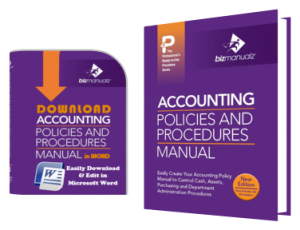 Accounting procedures may vary in detail based on the size of the accounting department or organization involved and the type of activity performed. Accounting procedure writers shall consider this as well as the complexity of the accounting processes and interactions, and the competence of the accounting personnel involved. 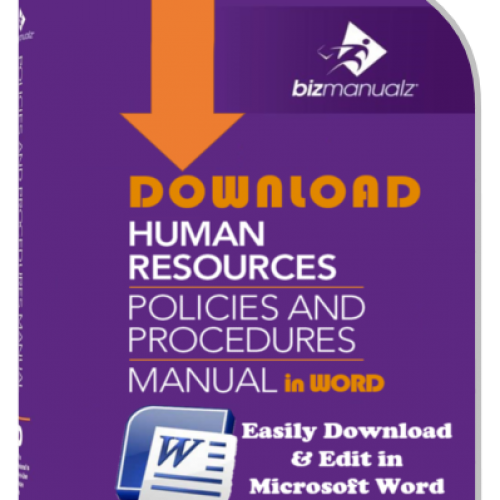 Documents may be any medium including: software programs, electronic text files, or hard copy documents for example. 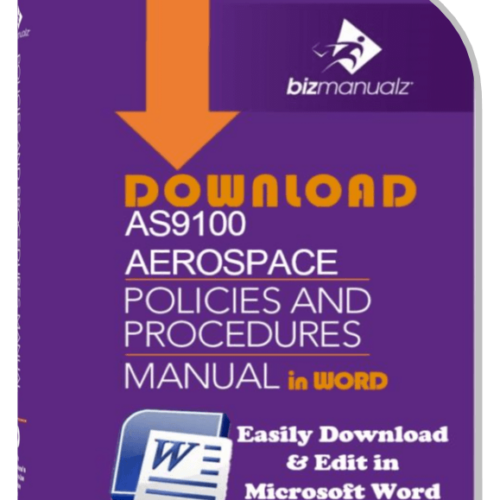 This Accounting Manual provides the top-level organizational document for the Accounting Management System. 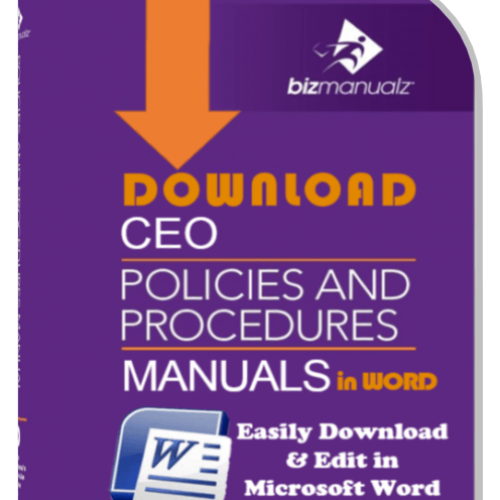 The Accounting Manual defines the scope, policies and processes of your company’s Accounting Management system as well as Management’s responsibility for the system. Approve accounting documents for adequacy prior to issue. Review and update as necessary and re-approve accounting documents. Ensure that changes and the current revision status of accounting documents are identified. 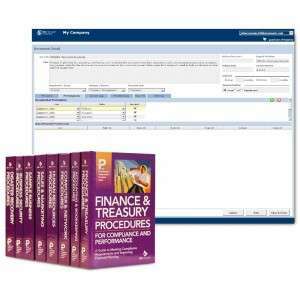 Ensure that relevant versions of applicable accounting documents are available at points of use. 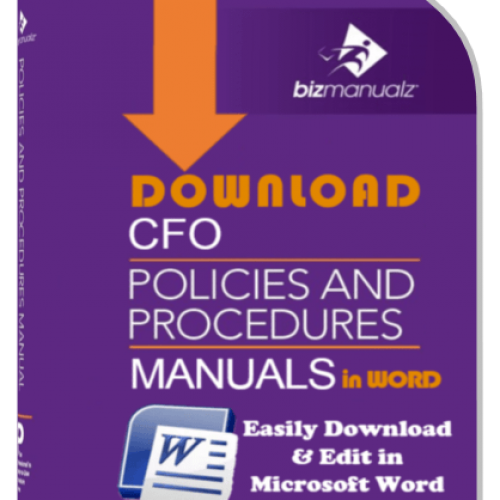 Ensure that accounting documents remain legible and readily identifiable. Ensure that accounting documents of external origin are identified and their distribution controlled. Prevent the unintended use of obsolete accounting documents, and apply suitable identification to them if they are retained for any purpose. Accounting Procedures define appropriate records to be maintained for the effective operation of the Accounting Management System, including evidence of conformity to requirements. Accounting Records shall remain legible, readily identifiable and retrievable. The Files and Records Management Procedure defines the controls needed for the identification, storage, protection, retrieval, retention time and disposition of records. Access to accounting system resources and records should be limited to authorized personnel only. Accountability for the custody and use of resources should be assigned and maintained as well. Periodic comparisons should be made of the resources with the recorded accountability to determine whether the two agree. The frequency of the comparison shall be a function of the vulnerability of the asset. Restrictions of access to resources shall also depend upon the vulnerability of the resource as well as the perceived risk of loss, both of which shall be periodically assessed. Physical security measures should be adopted to protect the assets and employees of the Company from abuse, fraud, theft, or damage. 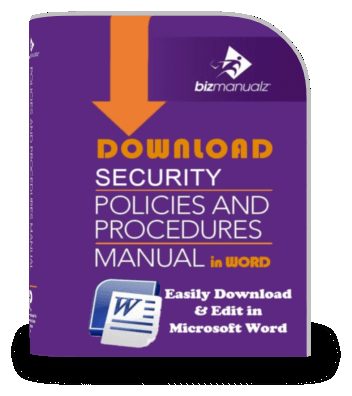 Security procedures for the protection of assets and employees are addressed within the company’s Security Manual. Disaster security measures should be adopted to enable the company to continue the operations of the Accounting Management System with limited interruption. 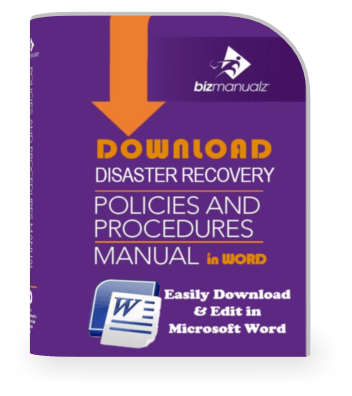 Disaster procedures for operations recovery are addressed within the company’s Disaster Manual. Information security measures should be adopted to protect the company’s information assets from unauthorized access, abuse, tampering, theft, or use. Information security procedures for the protection and authorized use of computer and network assets are addressed within the Company’s Information Systems Manual. 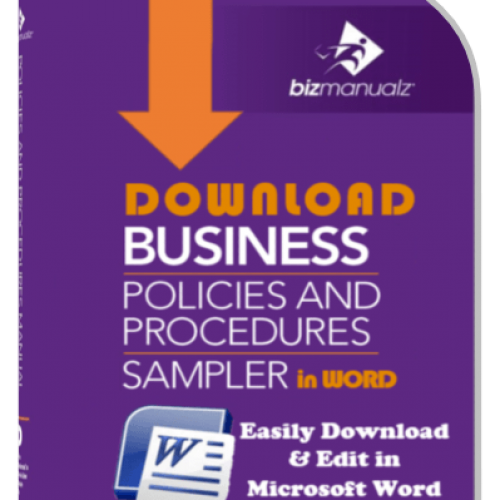 Download Free Sample Procedure Templates to see how easy it is to edit MS Word Templates to build your own policy and procedure management system. What Are Accounting Management Systems? What Are Internal Control Accounting Procedures? What Is an Accounting Department Organization Chart? factoring company is that you are paid immediately for every invoice that your company generates. I have personal experience in access the accounting system. Any categories of business must need accounts system then only know all financial transactions, revenues, expenses and payment records, etc. My choice for accounts management is Apptivo. 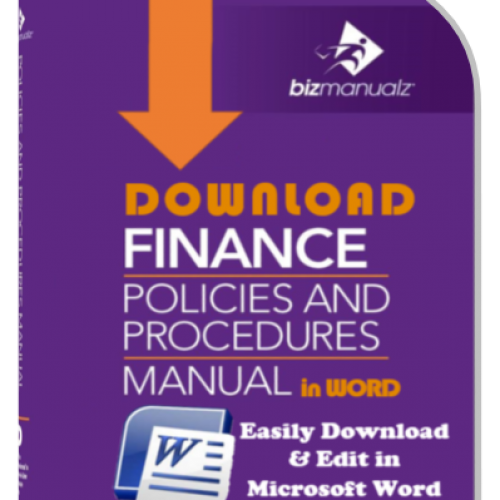 This tool helps to handle my business accounts without any failure. Proper accounts maintenance leads our business into success path. Thanks for sharing this article. I believe that if you are in the business world you must understand how accounting system works. I believe that this article is a great reference or guide for studying it. Thanks for sharing this article. Great article! This post will definitely help me to understand the Components of Accounting Management. This article is a big help for accounting beginners like me. Thanks for sharing this article. This article is very informative. I think that this will definitely help a lot of business owner to understand accounting. I believe that by understanding this business owners will be able to have an organized finances and successful business. Thanks for sharing this article.